Opulent elegance and luxury from Ireland. This wonderful golden elixir is an ultra-premium limited release (1000 bottles) of a wonderful Single Malt that was aged for at least 15 years in American oak. It's unmistakably Irish and non-chill-filtered to keep the unique lavish characteristics inherited from the carefully selected barrels. Bottled in an extravagant perfume-like bottle, it brings opulence and tradition of Irish Whiskey-making. The exceptionally rare collectors' Spirit is meant to be enjoyed neat or on the rocks. 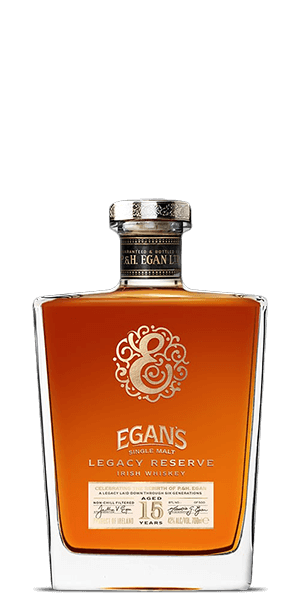 What does Egan's Legacy Reserve 15 Year Old taste like? The Flavour Spiral™ shows the most common flavours that you'll taste in Egan's Legacy Reserve 15 Year Old and gives you a chance to have a taste of it before actually tasting it. Vanilla, cinnamon and cocoa aroma with hints of musty oak, fruits and sponge cake. Creamy flavors of pears, peaches and cherries with a touch of nutty honey and a spicy echo.